Parliamentary Templar rushed the Altar Room and, for their own security, ordered Rachel Angela and her sister clairvoyants to vacant. They were to be corralled in rooms off the pronaos. Once sufficiently evolved, an oracular reading could not be suspended without dire consequences. The reading summoned for the dayâ€™s session of The Parliamentary continued to cascade increasingly alarming algorithmic patterns. Protocol demanded the program be allowed to work its course. While the other oracles of the Faithful were hurried out a side entrance, psiSadewa Rachel Angela remained to secure the oracular program sheâ€™d began unto a portable interface. That way, sheâ€™d be able to monitor remotely. As the Reverend Sister locked the final commands she shuttered to see the paneled doors that opened unto the assembly chamber’s orchestra floor draw apart and The Archangel led into the room by a young Templar disciple of Michael. Through the opened doors she spied a Templar disciple of Paul and her matron the Reverend Cardinal Mother zetaPetriss Katrina. They conversed with a holo-image, the avatar of a Faithful male in apostolic dress. Surveying his new surroundings from across the Altar Room, the Archangel turned and his pulsating gray eyes locked onto the sister oracle. Her thoughts stampeded with the memory of her commencement months before. The Celestial Collective subrogated her and through her heralded the Divinityâ€™s exile to Aideena. The sensations of that moment rushed backâ€”losing control of body while her own will was swept aside, yet still occupying her mind while also sensing she was elsewhere, everywhereâ€”and for a moment she swore it happened again. Coming back to herself and returning The Archangelâ€™s mesmerizing stare, Rachel Angela vaguely perceived that she knew the meta-terrestrial. Harboring an emotion like the remnants of a fading dream, she felt as though they shared a common intimate experience. What she grasped, however inarticulate, terrified her. He terrified her. He embodied an awesome cataclysmic threat to Aideena, to Creation itself. He stared back as though he recognized her and understood the source of her fear. Parliamentary Templar came to collect Rachel Angela. She gathered the configured portable interface and let them take her away, never stopping to break the Archangelâ€™s gaze until she was out the room. Sebastian, disciple of Paul, inflated himself larger at attention. â€œI accept full responsibility, your Honor,” he dutifully acquiesced. “I let the situation get out of my control. “As we all knew might be the case. Yet, we agreed anyway to permit Divinity to observe The Parliamentary,” spoke up the silvered haired woman standing next to the Templar. “Divinity is unpredictable. Your Reverend Sergeant, Prefect, handled Him as well as anyone. Itâ€™s done. Weâ€™ll all suffer the penitence. Let us focus on how to regain the dayâ€™s footing,” the Reverend Cardinal Mother summarily pardoned and dismissed Sebastianâ€™s attempt at self-sacrifice. Paul Sebastian xiDuang heard his partner Michael Constantine seal the paneled doors to the Altar Room, signaling he and The Archangel were safely isolated within. He decided to save a sigh of relief until they were all sequestered far from The Parliamentary. “Our immediate concern is securing the Assembly and resuming parliamentary proceedings. I want your Templar as quickly as possible to segregate the delegates from their entourages so they may return to session and finish their work,” petitioned zetaPetriss. “I represent the Seraphim in this matter, Prefect, and we are not prepared to concede that todayâ€™s session is a failure,” Cardinal Mother reproached with measured diplomacy. Petriss nodded thoughtfully. “I share your apprehension, Prefect,” she agreed without conceding. He found the sparring between his politic superiors dreadfully civil and he struggled to understand what it had to do with him. He prayed that heâ€™d never advance high enough to suffer such intellectualizing over every decision. Give him an order he can execute, by Creation, thought xiDuang, and donâ€™t bother him with the why and what-for. He imagined that Constantine, were he present, would be impertinent enough to argue his opinion with the Prefect and Cardinal Mother. But Cervantes and Petriss best have the patience of a Gaia winter should they expected him to weigh in so. The Cardinal Mother paused to weigh the chilled expressions on the faces of the men. She suspected that she miscalculated in holding the information from them this long, but like them, she too had her orders. It was then a roar erupted from one of the vomitories. Rachel Angela and Templar bolted into the Assembly, swept by a collective panic. Every detail had been orchestrated. The Parliamentary would convene and read through the proposed legislation reforming labor rights. After a Gaia-hour or two indulging the delegates’ inevitable political posturing, the Assembly would then ratify the package. 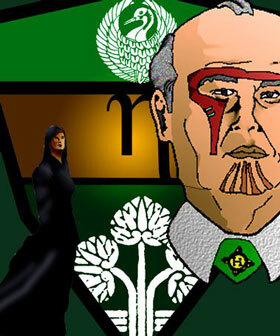 To add historical urgency, omegaMarat Seneca would accept sanction and step down as House omegaâ€™s chief designate. Sheâ€™d be permitted to stage one of her fiery reactionary vigils in the peristyle of the Acropolis. No one would know she was the reformsâ€™ actual principle author. 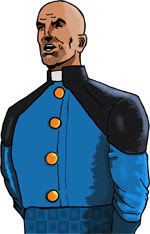 Consul Edmund etaSade would ride his reputation as a trusted Fellow in the Guild Brotherhood and the dependable ally of the powerful eta Matriarchy. He would take all the credit and, as far as the peoples of Aideena were concerned, be prosperityâ€™s hero. As champion of the male suffragetry, etaSade would be awarded control of The Parliamentaryâ€™s largest coalition of Guild political parties, elevating House eta from economic decline to a house to be reckoned with once again. For some mystifying reason, the eta delegate decided to step outside his designated role. As Faithâ€™s moderating official, Reverend Cardinal Paul Christian iotaTao could only sit and listen as etaSade picked apart everything that had been accomplished. 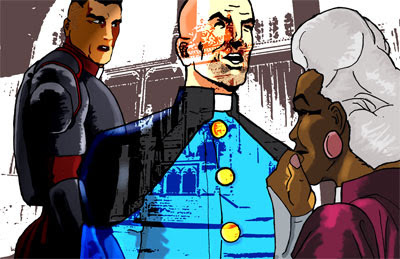 The secret meetings between himself, the activist omegaMarat Seneca, and the former Guild-Boss; the long hours of carefully constructing a reform package to satisfy Faith, the matriarchy of the Houses and fraternity of the Guild Brotherhood; all evaporatedâ€”as if they never happened at all. The Old Gentleman of The Parliamentary experienced something new in his forty-year career as Faithâ€™s master mediator and grand manipulator. The Reverend Cardinal was thoroughly dumb struck. An expansive black flurry of feathers landed with delicate precision on the center podium. Immediate hysteria ensued. Panicked delegates bolted, diving for cover. Courtly matrons and Guild-brothers leapt over desks and stampeded over one another. Then, everyone just stopped. Perhaps it was the beauty of the creature that had descended upon them. Or perhaps it was the fear and anticipation of what might happen next. Whatever the reason, the congressâ€™ flight reflex suspended momentarily. No one seemed to breath. All eyes locked spellbound on the podium and no one dare move a muscle. The silence of the Parliamentary formed an almost anathematizing vacuum. 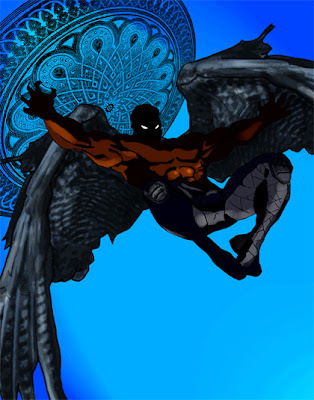 The wings parted and revealed beautiful dark skin that obscenely shelled a classically Herculean figure of perfect maleness. Its angular face carved a sinister intense mask. The Archangel’s scowl scanned the great cella, searching its tiers of desks and gallery above. He looked one way, and then the other. As Parliamentary-stationed Templar erupted into the vomitory, sidearm pulsons drawn, and cautiously assumed flanking positions, the intruder took no interest. He stood there, looking for something. Slowly, the delegates began to move. Shuffling and hushed voices broke the silence. Their frozen panic turned to intrigue. Reverend Cardinal Paul Christian iotaTao banged his gavel. He appealed for order and calm. He asked the assembly to resume their seats and the Templar to holster their weapons. They cautiously complied. Paul Christian waited. The Archangel did not answer. He did not sway from inspecting the room with a troubled stare. He did not seem aware of the Reverend Cardinal at all. As if homing in on a beacon, the meta-terrestrial sprinted down one of the vomitories, overrunning Parliamentary Templar, and out the assembly cella. Delegates followed after, instantly scrambling for the exits. The Reverend Cardinal hammered his gavel and ordered the congress back to their seats. This time, no one heeded. Select media, Parliamentary staffers and the Faithful, and dignitaries congregated within the large lounging vestibule outside the assembly cella. The area waded deep with auxiliary officials of all sorts both supporting various House and Guild representatives and those merely wishing to be nearby while The Parliamentary held it auspicious session. The Archangel burst onto the pronaos, trailed by delegates, and ignited pandemonium. He plowed through the panicked crowd, searching and examining their numbers as though they were inanimate objects to be inspected for defect and discarded. Templar Faithful Paul Sebastian and Michael Constantine came into pronaos, sweated and out of breath from their rapid descend. “Clear the Hall! Keep these people back,” Paul Sebastian shouted to Parliamentary-stationed Templar as he and tauValez pushed through the confused swarm. 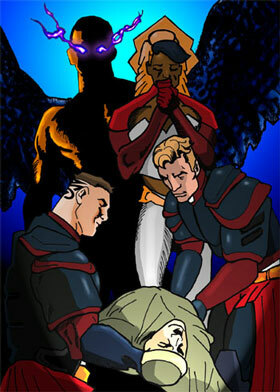 Sebastian and Constantine cautioned upon The Archangel. He scanned from one person to the next, oblivious to his Templar detailâ€™s arrival. The Archangel shook, as awakening from a peculiar daydream. Seeing Constantine and Sebastian, His brightly glowing grey eyes suddenly registered recognition and His demeanor transformed before them. The press of people surrounding them seemed to startle and unnerve the meta-terrestrial. “My Faithful, someone here is intent on murder,” He said. The two Templar looked at one another, shaken. “Who is going to be murdered?” Paul Sebastian spoke up. “As yet unknown, my xiDuang” He answered. “Who are you reading, Divinity,” Michael Constantine queried. The Archangel strained a look around, scanning the faces closing in. He shook His head, defeated.